The climax of Proterozoic Earth Time in Laurentia was a major event called the Grenville 'orogeny'. As an 'event' it was slow in human terms, in that the whole process took place over more than 300 million years. But its geological results were of intercontinental significance and are readily identifiable as an 'event' or well-defined episode in Earth Time. 'Orogeny' is a technical term, coined by the eminent American geologist G. K. Gilbert, for large-scale collisions of crustal rocks and the structural results of these immense collisional forces. Crustal rocks are folded, faulted and pushed about. Some are forced down into the semi-plastic interior of the Earth and others elevated to form mountain (orogenic) belts. Overall, there is considerable thickening of crustal rocks, which in the Grenville orogeny amounted to some 50 km thick. The thickened welts extend laterally over thousands of kilometres to form great linear belts of deformation, which we recognise as a particular kind of mountain range. 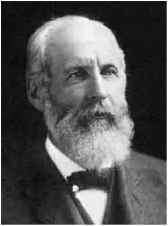 Grove Karl Gilbert, 1843-1918, American geologist, graduate of Rochester (1862), appointed senior geologist when the United States Geological Survey was created in 1879, who produced important descriptions of the Henry Mt. laccolith, Lake Bonneville, Niagara and Alaskan glaciation. He introduced new concepts of erosion, river and glacier development and coined the word 'orogeny' for mountain building. Laurentia between 1.15 and 1.12 billion years ago. The impact occurred all along a front that extended from what today is west Texas through the Appalachian region to the maritime provinces of Canada and associated areas of Scotland, Ireland and perhaps Scandinavia. The pace and magnitude of such events are hard for us to imagine, although similar events are going on today. The Grenville orogeny was characterised by the generation of huge thrust sheets. The collisional forces crumpled and deformed the rocks and then fractured them into huge, sheet-like slivers that were slammed together like a shuffled deck of cards. The slices slid over one another along major low-angle thrust faults for tens of kilometres. Consequently, highly deformed rock slices were driven over younger, undeformed rocks to form structures that puzzled geologists for many years. Analysis of Grenville-age thrust sheets shows that they were pushed northwards by the encroachment from the south of a continent-sized mass impacting on the southern margin of Laurentia. Similar structures are seen in the northwest of Scotland and when Murchison saw them he could not conceive of fault movements of such magnitude. He argued that the great slice of metamorphic rocks must have been formed in place. And, since sandstone strata with traces of life (worm burrows) occur below the metamorphic rocks, he concluded that all the metamorphic rocks of the highlands of Scotland were Silurian in age. 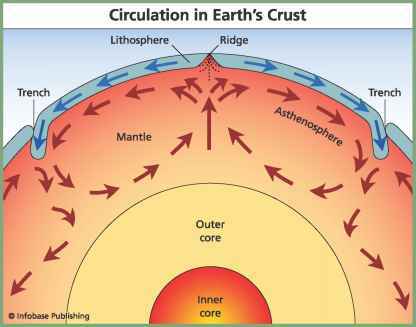 Current opinion and assessment of a variety of evidence strongly suggest that it was the Amazon craton of older Proterozoic and Archean continental crust rocks that did the 'damage' to the southern margin of Laurentia. The collision was part of the final assembly of the supercontinent of Rodinia, which stretched from the South Pole northwards across the equator.